Thank you for your participation in Partner Summit 2018. Visit the Cisco Partner Summit 2018 Content Archive Hub for access to session recordings, presentations, launches and announcements delivered at Partner Summit. Listen in to find out more about our vision, partner strategy, industry and how we plan to Lead Together. Data Center	 Net One Systems Co., Ltd.
Enterprise Partner of the Year S Net Systems Inc.
Canada	 Innovation Partner of the Year	 Information Systems Architects Inc. US: Central	 Cisco Capital Partner of the Year Sentinel Technologies, Inc. US: East	 Execution Excellence: Regional Partner of the Year	 AEC Group, Inc. US: East	 Meraki Elevate Partner of the Year	 Continental Resources, Inc.
Enterprise Networking	 CVE Technologies Group, Inc. US: West	 Commercial Territory Partner of the Year CompuNet, Inc.
ASEAN	 ASEAN Partner of the Year	 Trends and Technologies, Inc.
Japan	 JAPAN Partner of the Year	 UNIADEX, Ltd.
Due to the proximity of the event dates, online hotel reservations are no longer being accepted. Please contact the hotel directly for any new reservations or changes and/or cancelations to existing reservations. Both properties are within walking distance to the Mandalay Bay Convention Center. Please note: Smoking is not permitted at either of the hotels. Additional fees may apply if you plan to bring a pet. Please check with the hotel directly on pet size limitation and fee. Maximum of 3 guests in the room. Rick leads the Americas Partner Organization (APO), which is Cisco’s largest geographical region representing the United States, Canada, and Latin America. APO helps 23,000+ Cisco partners across the region expand their businesses with new business models, enter new markets, and create solutions that solve our customer’s challenges. Vicki Batka leads Cisco’s Partner Organization in APJC, a role where she is responsible for developing and enabling the growth strategy of Cisco’s partner ecosystem, to deliver value to customers. She leads a team which collaborates with close to 20,000 partners in APJC to drive simplicity, ensure alignment and create value exchange for our customers, while working with the Global Partner Organization to successfully scale global channel models across the region. The Executive 1:1 program offers partners a chance to discuss business and development issues with Cisco executives. Meetings are 60 minutes long and must be scheduled in advance. Onsite requests will be evaluated on a case-by-case basis. Contact your PAM to schedule a meeting. The Partner Hub provides an environment where attendees connect, share ideas, build relationships, learn, and recharge. Included in the Partner Hub is the Ecosystem Showcase where partners can connect with solution partners to form new business relationships, explore new market opportunities and drive incremental sales, together. Cisco demonstrations showcasing our latest products, solutions and services will also be available. Monday, November 12 9:00 a.m. - 5:00 p.m.
Tuesday, November 13 11:00 a.m. - 12:00 p.m.
Wednesday, November 14 11:30 a.m. – 5:00 p.m.
Lead the transformation to software and recurring revenue by developing a profitable Software-led business. Learn about the framework to accelerate your success and help you plan, prioritize and get ready to sell more Software/Recurring Offers. Find out about the tools and resources that are available today to support you on your journey. Lead with Enterprise Agreements (EAs) – find out how to enroll and get started with this strategic Customer offer. In today’s complex multicloud world, keeping up with the application landscape is more challenging than ever before. This demo provides and overview of how AppDynamics can help by making your infrastructure app-aware, enabling teams to: Understand how network policies and infrastructure configurations impact the applications running on them; Detect and remediate issues before they impact customers; Ensure application performance across public, private, and hybrid cloud environments. The way people work is changing. Your customers are being asked to transform their customer experiences, improve employee engagement, and enable new team workstyles. Get a first look into the huddle space market opportunity. Explore the new innovations to capture this high-growth market. Learn about Cisco’s global calling solutions to serve businesses of all sizes. Experience new and upgraded devices and apps. By connecting to workflows, these multiply the impact of people, content, and networks. As applications evolve from on-prem hosted workloads to cloud-enabled and cloud-native platforms, the role of IT is changing from serving to driving the business. Cisco HyperFlex is uniquely positioned to deliver on-prem features that rival the speed and simplicity of public cloud solutions, while offering pay-as-you-grow economics that address the need for easy scaling. Hyperconverged Infrastructure allows IT to spend less time integrating and operating infrastructure by eliminating the silo-approach to the network, compute, and storage components that make up the data center stack. HCI offers a “datacenter in a box” approach, as it simplifies all phases of data center management: implementation, design, operations, and troubleshooting. Meraki is simplifying IT. By removing excess infrastructure and hosting management of everything from wireless APs to switches to smart cameras in a unified dashboard, Meraki increases operational efficiency for customers and partners alike. Custom business solutions built on Meraki APIs can be designed for each organization's specific needs. Learn about the Meraki full stack solution, and how Meraki smart cameras and SD-WAN are defining their categories. Organizations want to extract more intelligence from their data throughout its lifecycle. Artificial intelligence (AI) enables organizations to learn from data and make better, faster decisions. IT leaders need systems and solutions that adapt to emerging machine learning applications, demystify the machine-learning software ecosystem, and prevent islands of AI/ML infrastructure. With Cisco® AI/ML computing solutions, IT organizations can capitalize on the adaptability of Cisco machine learning computing solutions to power AI workloads at scale, reduce risk through the validation of a broad set of technologies designed to extract more intelligence out of all stages of the data lifecycle, and simplify operations with a cloud managed system. Looking to simplify your business processes while growing your recurring revenue streams? ConnectWise solutions are designed to address the unique challenges of managing your Cisco® lines of business. See how our integration with Cisco tools helps you save time, sell more, solve invoicing nightmares with cloud billing software, and gain more insight into your business. We are living in the era of the completely connected customer – a time in which expectations for a fast, frictionless and tailored experience have never been greater. You are in the driver’s seat, and the Customer Experience team is here to support you with a wealth of resources and information. Come see how we can help you grow a successful customer lifecycle practice, and learn some easy ways to automate more digital touch points at key milestones in the customer experience. Using co-branded content, you will be able to promote adoption, simplify renewals, and upsell to higher value solutions on your way to our common goal – giving customers what they want and supporting them as they choose, use and love Cisco solutions. An interactive digital platform that helps partners navigate the steps of transformation. It answers the 'HOW' questions, and creates a customized path for each partner to sell, deliver and manage digital solution. Cisco DNA Spaces is the first unified cloud platform for indoor location services, digitizing people, spaces, and things. With customer demand for more robust Wi-Fi, Cisco DNA Spaces can help accelerate Wi-Fi infrastructure upgrades to deliver new location services for lines of business. In addition, partners can execute on a brownfield sales motion that will add value to current Wi-Fi investments and secure Cisco Wi-Fi infra at time of refresh. The Cisco DNA Spaces partner app ecosystem extends the value of location data. This new app ecosystem will provide vertically relevant context and deeper insights in combination with other data sources. Partners can deliver more valuable for the enterprise, and open up new market opportunities for themselves. DUO Security -Duo and Cisco are working together to help organizations migrate to a modern, Unified Access Security architecture. We will be ready to demonstrate how Duo provides an integrated platform for information security, offering user, device, and application access security across users with varying trust levels, personal and corporate devices, and local/hosted/cloud environments. SD-WAN - Please visit the SD-WAN demonstration to see a better user deployment experience that can deploy in minutes, allows for greater agility, and faster WAN performance using less bandwidth. Also, advanced threat protection that encrypts all data from the WAN edge to the cloud, securely connecting users to applications. Cisco Networking Academy Talent Bridge connects Channel Partner employers with world class talent for the digital economy workforce of the future. The Talent Bridge expands its free services to include the ability for partner employers to rapidly source qualified military veterans for their open jobs. The new service will enable Cisco partners and key customers to identify candidates for both technical and non-technical positions based on education, experience, location, and language proficiency In addition to veterans the Talent Bridge Matching Engine provides an ongoing pipeline of Cisco Networking Academy workers skilled in cybersecurity networking and software services. Cisco DNA Partner Profitability - Model your NPV, ROI and up to 5 years of potential profitability with each Cisco DNA investment (Cisco DNA Assurance, SD-Access, SD-WAN). Transition from rack, stack, and deploy to business intent services with confidence. Join us in this demo to learn how you can: Validate business intent with Cisco Network Assurance Engine: predict the impact of changes, proactively verify network behavior, and assure policy and compliance. Gain visibility with Cisco Tetration: deep forensics across everything in your data center in real time. Use our industry-leading SDN solution, Cisco ACI, to automate and simplify network provisioning and operations. Together, these solutions empower you to learn from, adapt to, and protect your applications in a constantly evolving environment. Cisco Managed Services Accelerator (MSX) is a multi-tenant, multi-service, cloud-native service creation and delivery platform. It enables service providers to rapidly deliver managed network, security, SD-WAN, virtual branch, managed LAN, and other business services to the market. Using MSX, service providers can create entirely new services from scratch or leverage pre-built service packs from Cisco. Whether deployed on the SP's infrastructure or as a cloud-based SaaS, MSX can be up and running with minimal integration costs and time, offering an unlimited range of managed services based on both virtual or physical network functions from both Cisco and third-parties. We're an interactive booth that seeks to understand the partner experience with Cisco. Come participate in one of our activities to tell us about your experiences with Cisco and share your thoughts on how we can improve! Count on our programs to power your growth, inspire your innovation, extend your market relevance and focus on your profitability. Your continued success is our top priority. The Partner Proof of Value (PPoV) cloud-based console makes it easy to provision, manage, and track Umbrella customer trials. Now Partners can deliver reports directly to customers showing the value of their Umbrella trials from their own multi-org partner console. In addition to PPoV we will also showcase new feature additions such as Umbrella App Discovery and Blocking, Secure Wi-Fi Integration, Secure SD WAN and Meraki Integration. The partners listed below will be exhibiting on their assigned day so please be sure to make time to visit them accordingly. Approved Contact Apple | Cisco Partnership Bar Code India Ltd. This invitation-only event takes place on Wednesday, November 14 from 5:00 – 6:30 p.m.
Thursday November 15, 9:00 a.m. – 11:00 a.m.
All Geo Connection Sessions will take place on Tuesday, November 13 from 12:30 p.m. - 1:30 p.m. Together, we can drive a customer-obsessed culture anchored in software, application development, and recurring revenue. Rick and Jeff will share our FY19 sales priorities, including initiatives to help you build a successful lifecycle practice. In this session, you will hear from key regional Cisco APJC executives, including Miyuki Suzuki, President, APJC, Vicki Batka, Vice President, Partner Organization, APJC, and Chris Heckscher, Vice President, Customer Experience, APJC as we look forward to share our strategy to help our partners be successful in FY19. Our customers face a similar challenge. How do I use technology to thrive in a digital era and push the boundaries of what is possible? At the same time, the world continues to change, and our customer technology needs continue to evolve over time. The ‘why’ is clear, the tricky part is the ‘how’. Our collective power lies in our ability to help customers better understand where they are today, where they need to get to, and delivering unrivaled value and innovation that positively impacts our customers across the entire lifecycle. In order to stay ahead in the market and capture the opportunity, it’s time to lead together. Impact sessions are designed to give deeper insight and actionable direction into various topics like our technology architectures, go to market and partner practice evolution. For a full list of Impact Session details, click here. Tuesday, November 13, 2:30 p.m. – 3:30 p.m. The Executive Forum will provide an opportunity for partners to meet and interact with selected worldwide Cisco leaders. These sessions are designed to allow partners to ask top-of-mind questions directly to the leaders in a small, informal group setting. The sessions will be unscripted and free-flowing, allowing the partners to set the tone and conversation. 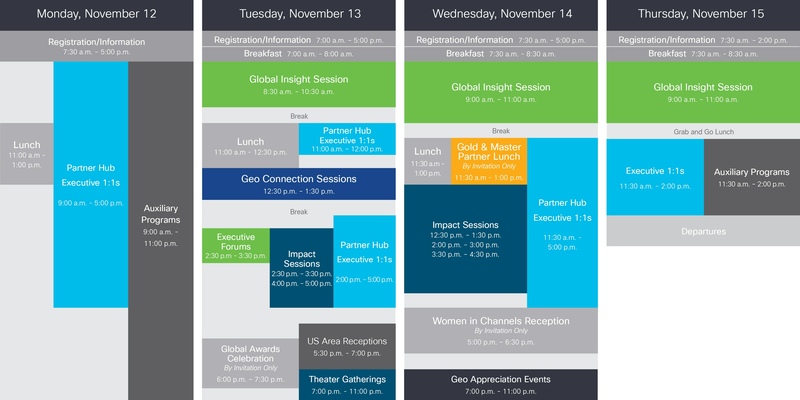 In bringing together Cisco executive leadership with the global partners, the goal of the Executive Forum is to provide participating partners with an exclusive, intimate and personalized experience.